The Midwest Inland Port area has access to 33 million people within one day’s drive round trip, including the cities of Chicago, Indianapolis, St. Louis and the outskirts of Milwaukee. The population within this Midwest Inland Port region is projected to grow over 3.8% in the next five years. 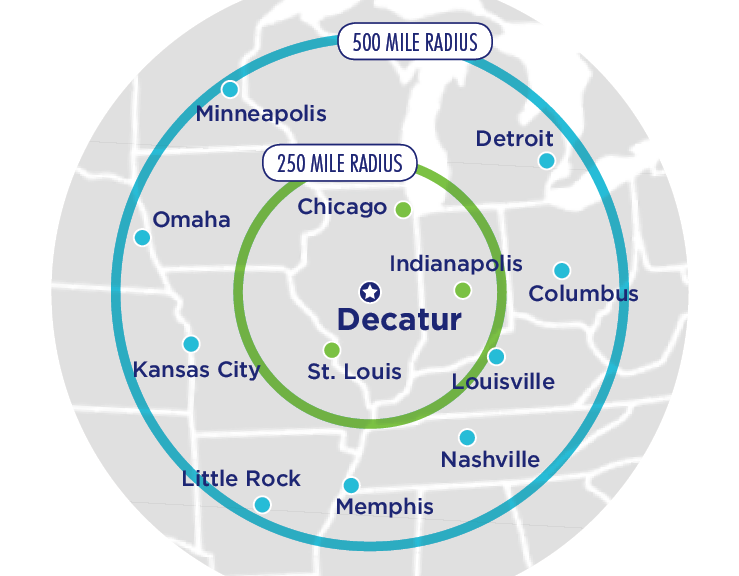 The Midwest Inland Port has access to over 95 million people within 500 miles for same day delivery service, including Chicago, Milwaukee, Detroit, Columbus, Atlanta, Nashville, Memphis, Wichita, Omaha and Minneapolis. The population within the Midwest Inland Port region is projected to grow over 3.4% in the next five years.